New Disney Parks rules prohibit smoking, oversized strollers and "loose ice"
A new policy, set to go into effect May 1, 2019 at both the Disneyland Resort in California and the Walt Disney World Resort in Florida, restricts stroller sizes to no larger than 31 inches wide by 54 inches long, a decrease of 5 inches in width from current guidelines. The new rules also ban the use of accessories that are attached to strollers or electronic conveyance vehicles (ECVs), such as glider boards or trailers. Disney says a majority of single and double strollers on the market fit within the new guidelines, and a review of the best-selling double strollers on Amazon.com as well as the top double stroller recommendations from both Babylist.com and New York magazine yielded only one model that doesn't make the cut: the Baby Trend Expedition double jogging stroller, which is an inch too wide. Most double strollers, and even some models that can carry four children, fit the new guidelines. The Disneyland resort plans to introduce a new tandem double stroller by May 1, and make additional upgrades to its rental stroller fleet in the coming months. Disney provided a photo of the new tandem stroller, which appears to be the Joovy Caboose Too model. Unlike the Walt Disney World resort in Florida, Disneyland has not previously offered a double stroller for rental, which meant that parents of multiple young children had to either rent multiple single strollers or bring their own double strollers from home. 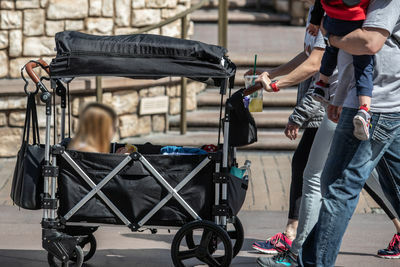 A tandem stroller similar to what Disneyland visitors can rent at the parks starting May 1. Photo © Disney. Existing policy prohibits visitors from bringing traditional pull wagons like the Radio Flyer and Step2 into the parks, and will expand that restriction to include all collapsible stroller wagons like the popular Keenz 7S and Veer Cruiser as of May 1. Many Disney fans applaud this decision, but some question why the Keenz wagon—which at 27 inches wide and 44 inches long is well within the new, smaller size limit—was banned. Disney will enforce an existing policy that bans stroller wagons like this from the theme parks effective May 1. Photo © Disney. The manufacturer of the Keenz wagons caused additional confusion last week when they issued a joint press release with an Orlando-based independent stroller rental service stating that Keenz would be exempt from the new rules. The company finally confirmed Thursday afternoon that its wagons are not permitted under Disney's new rules, and appealed to parents to contact Disney to protest the change. Some parents who have children with special needs, or rely on an oversized stroller for triplets or quads, asked what their options are after May 1. A Disney spokesperson told MousePlanet, "We have and will continue to work with guests to help ensure an enjoyable visit for all of our guests," and that "Nothing has changed about how we make accommodations for guests with disabilities." 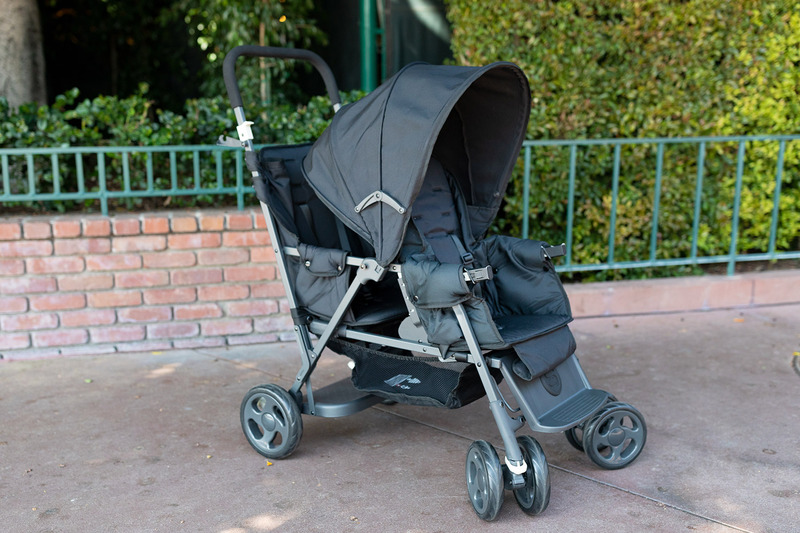 Read more about the new stroller policy on MousePlanet. 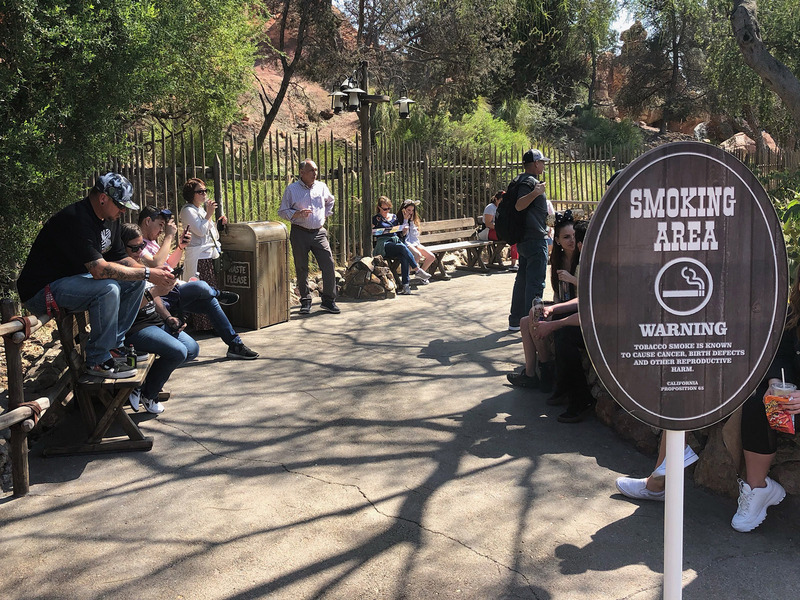 In-park smoking areas like this will close as of May 1, when Disney implements a new ban on smoking in its U.S. theme parks. Photo by Todd Pickering. After Wednesday, May 1, those who wish to light up must exit the park and go to a new designated smoking area beyond the security checkpoints on the Harbor Boulevard (east) side of the main entrance. Read more about the new smoking ban on MousePlanet. One final policy change was announced in a Disney Parks Blog article titled "Moms Panel Update: Know Before You Go – Tips for Your Next Park Visit," and went into effect immediately. Visitors may no longer bring loose ice or dry ice through the security checkpoint or into the theme parks. Reusable ice packs, frozen water bottles, and small sandwich- or gallon-size freezer bags of ice will still be permitted, and, as always, guests may request complimentary cups of ice at quick service food locations. As explained by Disney in response to questions on Disney Parks Blog, the ban on loose and dry ice in coolers is intended to streamline security bag check and park entry. We've already shared that camping out won't do anything to get you into Star Wars: Galaxy's Edge on May 31, because you'll need a no-cost advance reservation to step foot onto the fictional planet of Batuu and wander the streets of the Black Spire Outpost between May 31 and June 23. Disney has not yet said when or how it will open this reservation system, but park officials did share some additional details and answer some questions about who can make a reservation and what to expect during your visit. Read more about how you can get your boarding pass to Batuu on MousePlanet. In just over two months, the Disneyland Resort will open the gates to Star Wars: Galaxy's Edge, and welcome the first visitors to the fictional planet of Batuu. In January, we detailed some of the preparations Disney managers are making in advance of the grand opening, which Disney has code-named Project Stardust. Now we have an update both on the work already announced, as well as new projects planned for spring and summer 2019. Read how Project Stardust will bring wider walkways, MaxPass updates and parking and security expansion to the Disneyland Resort on MousePlanet. 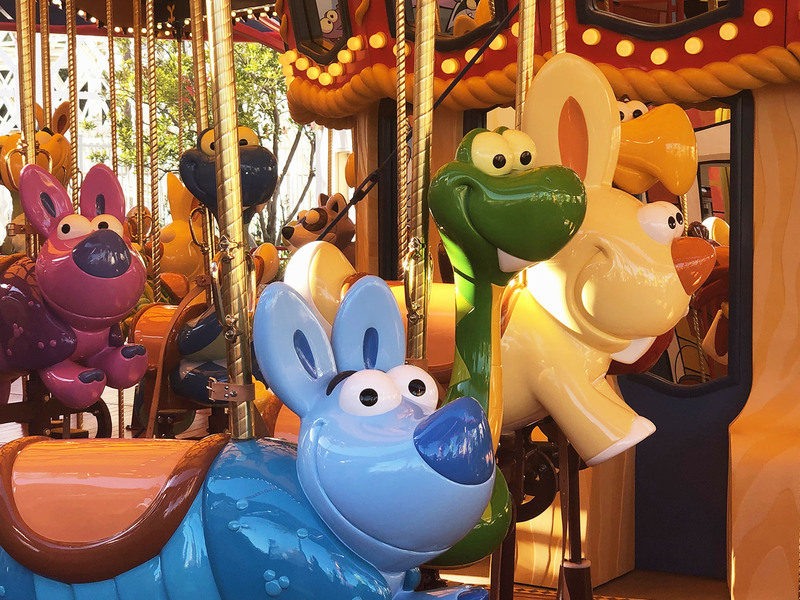 Jessie's Critter Carousel was scheduled to open in April, but made a surprise debut at Disney California Adventure last week. The ride, rethemed from King Triton's Carousel, and was one of the final elements of the conversion from Paradise Pier to Pixar Pier. Jessie's Critter Carousel is now open at Disney California Adventure. Photo by Todd Pickering. 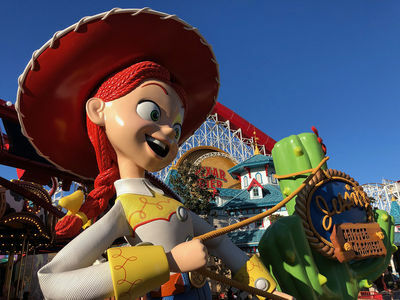 An oversized figure of Jessie stands outside the attraction, and the sea creatures from the original attraction have been been replaced with Jessie's critter friends from "Woody's Roundup" in Toy Story 2. The critters are cute and whimsical, and the backwards-facing skunks are a hit with some riders. Riders can choose their favorite from a herd of of smiling critters. Photo by Todd Pickering. Disney will finish Pixar Pier later this year when a re-themed Flik's Flyers ride from the now shuttered "a bug's land" reopens as the Inside Out Emotional Whirlwind on the west side of the area. 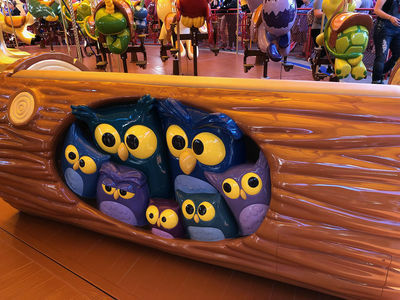 A family of owls peers out from the a bench seat on Jessie's Critter Carousel. Photo by Todd Pickering. More than a decade after it was first rumored to be coming to the West Coast, Mickey's PhilharMagic is set to open this month in Disney California Adventure. The show will open in the Sunset Showcase Theater in Hollywood Land, which opened in 2001 as Muppet*Vision 3D. 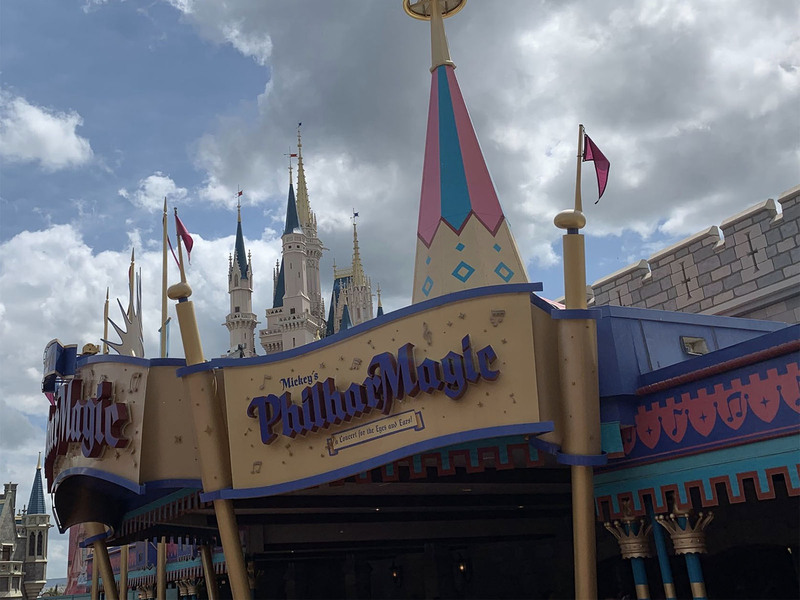 Mickey's PhilharMagic is a popular attraction at Walt Disney World, and a version is now planned to open at Disney California Adventure in April 2019. Photo by Alan S. Dalinka. Opened in 2003 at Walt Disney World's Magic Kingdom, Mickey's PhilharMagic remains an extremely popular attraction in that park. It has since opened in Hong Kong Disneyland and Tokyo Disneyland, using the same extra-wide screen format as the Florida production. At Disneyland Paris, where the show replaced an existing movie attraction, the film uses just one screen. A Disney spokesperson confirmed to MousePlanet that the version coming to Disney California Adventure will be the one-screen film produced for Disneyland Paris. There is one special effect from the Florida show that the Disneyland Paris theater was not equipped to re-create, however. We'll have to wait a few weeks to see if the former Muppet*Vision 3D theater was better able to handle the Backside of Waterfowl. Originally introduced in 2013 as a Limited Time Magic promotion, Egg-stravaganza returns to the Disneyland Resort this April 5 through Easter Sunday, April 21. The egg hunt expanded to Downtown Disney in 2016, and there will once again be eggs there, as well as hunts inside both Disneyland and Disney California Adventure. A dozen oversized eggs decorated with images of Disney characters will be placed around each of the three hunt locations. Egg hunters first purchase a special map and stickers to help locate these eggs, then place the stickers on the corresponding spots on the map. The maps are $6.99 plus tax, and no discounts apply. Maps are sold at select merchandise locations in the theme parks and Downtown Disney. You may also find them for sale in the gift shops at the three Disneyland Resort hotels. Once complete, participants return the map to a redemption location to claim their prize—one of six different two-inch-tall "eggs" featuring all-new character designs for the 2019 promotion. Redemption centers are located at Elias & Company at Disney California Adventure, Disney Showcase in Disneyland, and World of Disney in Downtown Disney. If you are only in it for the eggs, you don't need to complete the egg hunt to claim your prize—just buy your map at a redemption center and receive your egg. In the earlier years of this event the eggs were awarded randomly, but in recent years participants have been able to choose their favorite character, while supplies last. In keeping with the film's setting, the El Capitan Theatre is decked out with circus bunting, posters, and props. There are several photo opportunities for theater-goers to enjoy before or after the show, including one with Dumbo himself. The theater's lower level contains a small display of costumes and props from the film. The best part of seeing the movie at the El Capitan Theatre is the pre-show entertainment. 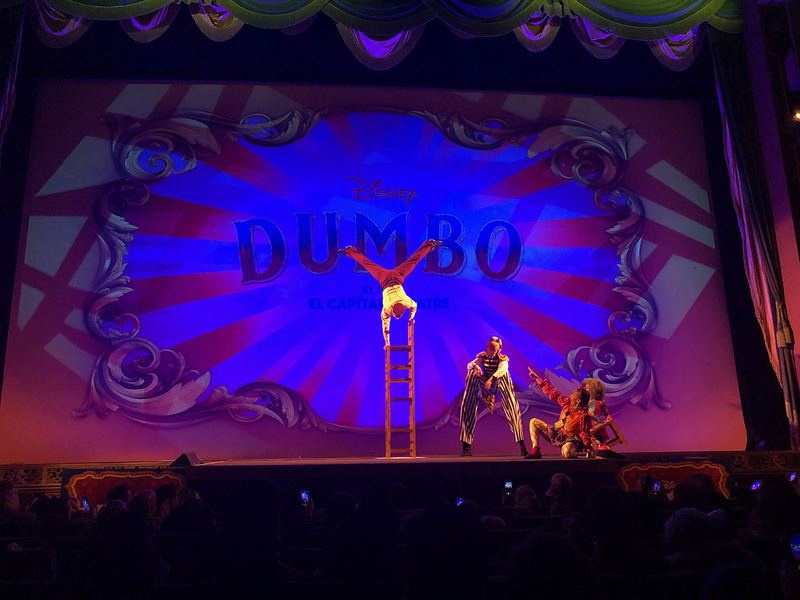 Classic Disney songs are performed on the theater's "Mighty Wurlitzer" pipe organ as the audience takes their seats, then the stage comes alive with a performance of circus arts featuring juggling, a contortionist, a clown and an amazing acrobat. Performers demonstrate circus skills during the pre-show at the El Capitan Theatre in Hollywood before each screening of "Dumbo." Photo by Todd Pickering. The film truly re-imagines the Disney classic with a focus of this film on humans. We have Holt Farrier (Colin Farrell) returning to the Medici Brothers Circus from World War I. Farrier lost his arm in the war and can no longer ride horses, so is put in charge of taking care of the elephants. Farrier is reunited with his two children Milly and Joe (wonderfully played by Nico Parker and Finley Hobbins), who have lost their mother to an influenza epidemic. The themes of Dumbo being separated from Mrs. Jumbo resonate strongly with the human characters. Tim Burton includes lovely nods to the original animated classic but late in the film adds a handful of characters with unexplored back stories. At this point, the film is getting too long and there is not sufficient time to flesh these out. The lavish sets and costumes are what stick with us, but at just under two hours, the film is just too long and plodding, and may be difficult for the youngest fans to sit through. It's a three-ring circus, and Mr. Burton has too many balls in the air. Danny DeVito shines as circus owner Max Medici, balancing honesty and comic timing, and truly grasping the genre as a movie for kids. But no one can top the animated performance of Dumbo. It's those beautiful blue eyes that display such clear emotions that young and old alike will be able to understand. Dumbo runs through April 21 at the El Capitan Theater. Tickets are $13 to $26. Purchase online from the theater website. ...Georgia-based Rinse Bath & Body Co. will open its first California store in Downtown Disney Anaheim this spring. Disney fans may recognize Rinse Bath & Body Co. from the carts the company has at the California Food and Wine Festival and the Festival of Holidays. The Briar Patch (shop) – closed April 15 through at least May 12 for refurbishment. Sleeping Beauty Castle Walkthrough – closed through at least May 12 for refurbishment. 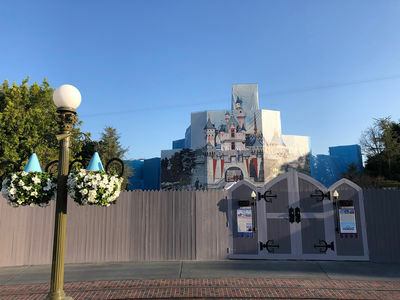 Sleeping Beauty Castle Enchanted Chamber – closed through at least May 12 for castle refurbishment. Cafe Orleans – closed May 6 through at least May 12 for refurbishment. Silly Symphony Swings – closed through at least May 12 for refurbishment. Red Car Trolley – closed April 1 through at least May 12 for refurbishment. Disneyland Resort merchandise – Disneyland has once again extended the additional 20 percent merchandise discount offered to Disney Signature Plus, Disney Signature, Disney Premier, and Premium annual passholders, this time through December 31, 2019. All other passholders receive a 10 percent merchandise discount. Visit the Annual Passholder discount page for specific details and exclusions. Downtown Disney District dining and merchandise – 10 percent off at Ralph Brennan's Jazz Kitchen (maximum discount of $40, excludes alcohol), Wetzel's Pretzels, and Alamo Rent a Car.